The morning before I planned to leave Marsh Harbor I started the generator as normal to re-charge the batteries and draw down the frig and freezer. No more than 5 minutes after the generator started it shut down. This had never happened before. I guessed that it might be an over temp condition. Normally this was preceded by an alarm, but since the hour meter was no longer working it was possible the alarm was not working as well. I waited an hour or so, and then started the generator again. This time I checked for water flow out of the exhaust. There was none, so I quickly shut down the generator. While sorting this problem out I used the main engine to charge the batteries and run the refrigeration compressor. The most likely culprit for no water flow is the impeller in the raw water pump. I’d never changed this impeller since I purchased Sarah with the generator installed. As a matter of fact I didn’t even know where the raw water pump was located on the engine. So I got out the parts catalogue for the generator and located the pump. Surprisingly it was fairly accessible on the forward, port side of the engine. I was able to remove the pump cover from the cockpit reaching through the aft lazarette. The four small machine screws that held the cover on the pump all came of with minimum effort. Maybe this was not going to be such a bad project after all. Northern Lights M642 Sea Water Pump Well I could not remove the impeller from the cockpit, so I emptied the contents of the port cockpit locker and climbed in. By squeezing myself (no small task) around the propane locker I could see the pump. The picture on the left is my view of the pump. In this picture the impeller has been removed. In order to remove the impeller I had to get two prying devices (aka screw drivers) into opposite sides of the impeller and pry it out. This was very difficult as the propane locker was in the way. I was just able to get one arm on each side of the locker and get two screw drivers into the pump housing. It took several tries, but finally the impeller came free. The picture on the right shows the removed impeller. I think I got my 25¢ worth out of this sucker. I have no idea when that impeller was installed. Suspect it was the original impeller in the generator when it was installed, nearly 20 years ago. All missing vanes on the impeller are a worry. They were not in the pump housing when I removed the impeller, so they are either in the hoses or the heat exchanger. First I have to get my hands on one of the spare impeller kits I have onboard. My first step was to start up my Inventory application on the PC and search for them – Not Found!. The inventory finds the impellers for the Yanmar engine, but not the Northern Lights generator. After trying several search options I gave up – I must not have inventoried those impellers, but I know I have them onboard. I then resorted to the brute force search method. I opened each locker in the aft cabin and removed every item looking for those impellers – Still Not Found. Finally it dawned on my. Prior to starting the Yanmar installation I removed all of the contents of the aft cabin lockers and the cockpit lockers. I put much of the stuff in the dockhouse at the marina, but some of the stuff went in the trunk of the car. After the Yanmar installation was complete, I moved the stuff in the dock house back onboard. It appears the stuff in the trunk of my car is still there – in Lexington Park, MD. So now the task is to find a dealer who can provide the impeller kit. From the Northern Lights website I found 2 dealers in The Bahamas, both in Nassau. I could have gone to a dealer in Florida to order them, but then I would have to deal with Bahamian Customs on my own. I decided to place the order with Marine Diesel Ltd. They did not have the part, but they did order it for my through the Northern Lights distributor in Florida. Almost immediately I got a call back saying that Northern Lights says the part number I gave them was obsolete and no longer orderable. I thought it strange that they would not just provide the superseding part number. I got my part number from the catalogue for my generator. I went to the Northern Lights website and downloaded the latest parts catalogue for this generator. 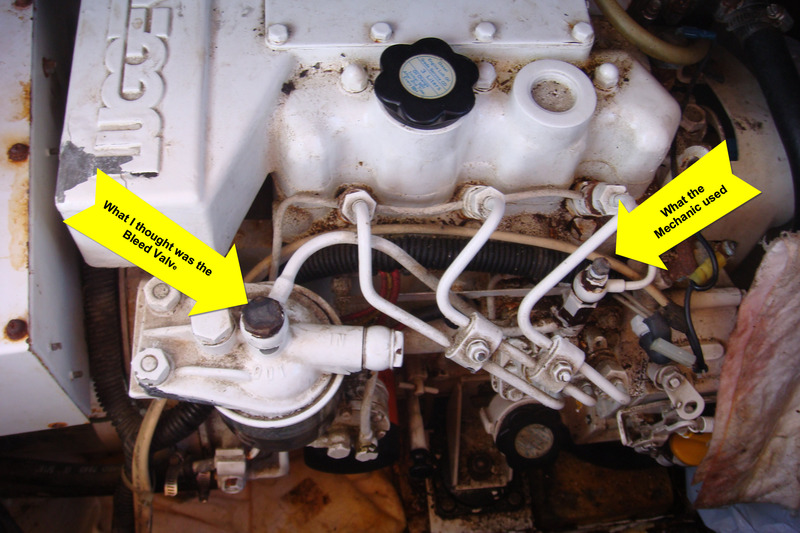 There I discovered new parts numbers for the water pump and I called them into Marine Diesel Ltd. That seemed to take care of the problem and I was assured my parts would arrive in 3 days, which they did. Then I discovered the danger of not reading the parts catalogue carefully. Those part numbers were for a different pump. My old pump had been discontinued for a number of years and the impeller kits were no longer available, at least not from Northern Lights. The only option now was to order a complete replacement pump – another 3 days. New Sea Water Pump Finally on Saturday, Jan 17 I had the new pump on board. The first thing I noticed was that an O-Ring is required on the pump mounting. No O-Ring was supplied with the pump. This appears to be just a 1.5”x1/8” O-Ring so maybe I can get one from a local HW store. In the meantime I need to get busy removing the old pump. I waited to remove the old pump until after the new one arrived so I had something to refer to other than the parts diagrams. Looking at the old pump and the diagrams I found it difficult to visualize how it was mounted. The new pump helped me understand those diagrams. Looking at the pump mounting base in the picture above, you can see there are holes for four mounting screws; however, two of the holes are threaded. So 2 of the screws are threaded onto the gear housing on the engine and the other two threaded from the gear housing into the pump mounting flange. Also the shaft that protrudes from the mounting end of the pump secures to something inside the gear housing. At this time I did not understand how this pump connected to what I assumed were gears inside the housing on which it is attached. Once more the drawings provided by Northern Lights were of no use. Having determined how the pump is mounted I started to assemble the tools necessary to remove the old one. The parts diagrams did inform me that the mounting screws are M8 cap screws. One is 110mm long, the other three are 60 mm long. The head of the 110mm screw is shown in the picture on the right. This longer screw goes the entire length of the gear housing. The threaded end of one of the 60mm screws are visible on the right side of the picture. 60 mm Mounting Screw The picture on the left shows the 60mm screw, which threads into the pump mount flange. As you can see getting a wrench on these screws is not going to be easy, especially since I cannot see these screw heads. I took these pictures by blindly aiming the camera. I had to take dozens of pictures to get a few that told me where the screws were located. The easiest screw heads to reach appear to be the ones that thread into the gear housing, so I decided to start there. First I removed the water hoses from the pump. When I did I discovered where most of the impeller vanes went – into the feed hose which attaches to the bottom port on the pump. Before I got too far I quickly discovered that I do not have an open wrench that will fit the heads of these screws. The heads are 13mm Hex. I have 12mm and 15mm open wrenches but nothing in between. That is not totally correct I do have a 13mm open wrench that came with the Yanmar engine, but these wrenches are pretty worthless. They have very thin faces, and do not get a really good grip on the screw head. I would be concerned about rounding off the heads with this cheap wrench. If possible, I wanted to use a box wrench on these screws to prevent rounding the heads. So it was back to the HW store on the next day (Monday) to get another wrench. I also picked up the O-Ring as well as replacement screws (incase I mess one or more of them up). Then work stopped for a couple of days. We had a series of cold fronts come through the Abacos on Tuesday and Wednesday, 1/19-20/2008. They brought a fair amount of rain and strong winds (20-25 kts) for most of those two days. I decided to not work on this pump while the boat was bouncing and rain showers were passing through. So on Thursday I finally started to remove the old pump. It wasn’t that difficult, just awkward and slow. I was able to get a socket on three of the machine screws that held the pump to the gear housing, but the third (naturally the longest) was the most difficult. This is the 110mm screw. There was just barely enough room to get the 13 mm box wrench on the head, and then there was only enough room to turn the screw one point before having to re-position the wrench. That screw will not come completely out of the gear housing, but with it loose I could pull the old water pump off the housing. In the picture on the left the old pump and the new one are side by side. Now I understood how the pump was driven. There is a gear on the shaft of the old pump. The gear is seated firmly on a tapered shaft. I do not want to try to pry it off the old shaft as that would likely damage the gear and the old pump. I want to keep the old pump in my parts bin as a backup or I will sell it on eBay – that is assuming those old impellers are still in the trunk of my car and they are serviceable. So I now need a gear puller. One more trip to the Marsh Harbor HW and automotive stores produced nothing satisfactory. Finally I called the Marsh Harbor Boatyards and arranged for their machinist or mechanic to remove the gear from the old pump and put it on the shaft of the new one. When I removed the old pump I found more impeller vane debris in the intake port of the pump. It is amazing how long that damaged impeller was still able to pump water through the heat exchanger. I believe that impeller was in bad shape when I bought Sarah in 2000. It never put out much water through the exhaust, but I had never seen the normal water flow for comparison. I put several hundred hours on the generator with that water flow. It will be interesting to see what the flow will be like with the new pump and an intact impeller. Before installing the new pump I took a picture of the pump housing to insure I understood how the pump would fit. In the picture on the left you can see the gear that engages the pump protruding into the right side of the housing. Mounting the pump was fairly straightforward at first. I was getting pretty good at working those largely inaccessible machine screws. However once the pump was mounted I had a problem connecting the output hose going to the head exchanger. As you can see in the picture on the right the hose barb on the pump is very close to the engine. So close I could not get the hose onto the barb. The hose barb has a small flange that increased the outside dimension of the barb by about 1/8”. My only choice was to remove the pump and file down that flange. So I got a little more practice on those inaccessible screws. After the 30 minutes of filing the hoses would once more fit on the pump. I decided to attach the output hose before mounting the pump. There still wasn’t very much room between the barb and the engine. That would come back to bite me in 2014, when I next visited Marsh Harbor. After another struggle with the screws the pump was mounted and the hoses connected. Now I was ready to test the generator. I opened the seawater valve for the generator and hit the starter. The generator came to life quickly and I checked over the stern to see more water coming out of the exhaust than I’ve seen in my ownership of Sarah. Clearly the impeller was failing when I purchased this boat. It is amazing that it continued to work for the past 8 years. That is probably a testament to how Northern Lights may have over-engineered the cooling system, but also to the fact that I’ve never really put a heavy load on this generator. Well I was ready to declare victory, put my tools away, and plan for an early departure from Marsh Harbor in the morning. Then I looked down into the locker where the generator is installed. Not only was the generator putting a lot of water out the exhaust, it was also putting a lot of water into the boat. Sea water was streaming out of the water lift muffler. The end plate on the muffler had finally corroded through. I think it had been leaking slightly for some time. You can see the accumulation of salt next to the trap. Now I was back to a non-working generator and the need for a part I can’t find locally. I was totally bummed from a 3 week ordeal of getting parts and now back to the beginning. After one night of feeling sorry for myself (and doing major damage to the liquor locker) I once more contacted the Marsh Harbor Boatyard to order a replacement water lift muffler and to get back on the mechanic’s schedule. The muffler was immediately ordered, but the mechanic was not available until Feb 10, more than a week away. I spent a couple of days trying to get the old muffer removed. I really wasn’t trying very hard, I had pretty much resigned to sticking in Marsh Harbor until the 10th and then let the mechanic do the job. So finally on the morning of the 10th I pulled up the anchor for the first time in over a month and motored around Mat Lowes Cay to the boat yard on the other side of Marsh Harbor. Within a few hours the mechanic had the old muffler out and the new one in place (picture on the left). I started the generator and it came to life and kept running. We had excellent water flow and 120 volts on the power panel. Everything looked good. 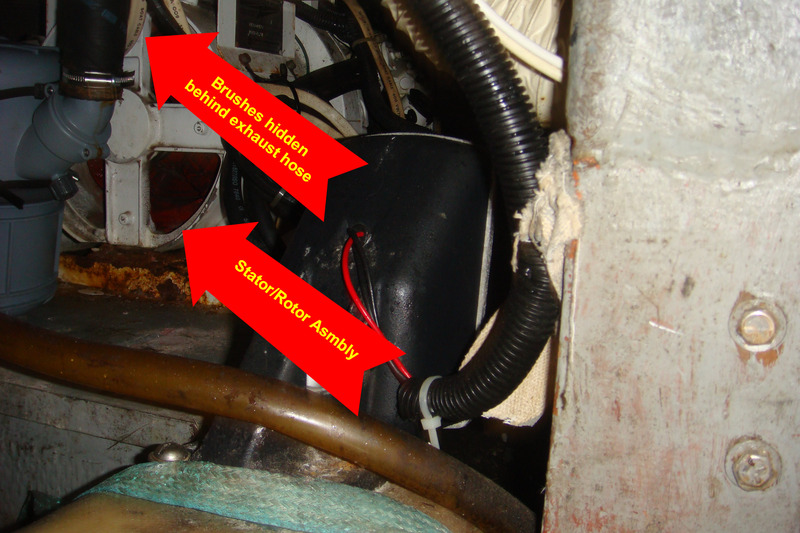 The mechanic hung around to tighten the stuffing box on the rudder (the bilge pump was coming on twice a day for about 20 seconds), and did a quick review of the main engine installation (he’s a Yanmar guy). It was nearly lunch time so the mechanic left and I started straightening up the boat. I decided to run the generator all afternoon to be sure it was working properly. When I restarted the genset I realized that I had all the power loads turned off when we ran the generator earlier. When I turned on a few loads the genset engine stalled. After that I could start it, but it would quickly stop. This was pretty much the symptom I had when I started on this voyage of discovery. Now I was certain this was a fuel problem. I was also fairly certain this was the original problem, not the lack of seawater flow through the heat exchanger. All those water pump/muffler problems were real and needed to be fixed, but the basic problem that caused the genset to shut down had not been addressed. The first thing I checked was the primary fuel filter. It was a little dirty, but nothing severe. I replaced it with a new cartridge just to be sure. When I restarted the genset it still stalled and shut down under load. Next I attempted to bleed the fuel lines. The owner’s manual provides no guidance on how to do this. On engines I previously owned the bleed valve was on top of the secondary fuel filter. I loosened the bolt and manually operated the lift pump and got clean fuel out of the valve. I closed the valve and once more started the engine – same problem. Although I was still convinced this was a fuel problem, I was stumped. I had done all the things I knew to do. I had already gone to the yard office and requested the mechanic return to help me with the problem. He had gone to another job and it was a couple of hours before he returned. The first thing he pointed out was that there was another bleed valve on the fuel line going into the injector pump. When he bled that valve he got lots of air bubbles until the fuel started to run solidly. We restarted the genset, but it immediately shut down. The mechanic opened the bleed valve once more and once again got air bubbles in the fuel lines. Still the genset would not stay running. We repeated the bleeding several more times until there were no bubbles when the valve was opened. Finally we were able to start the genset and it stayed running under full load. I stayed at the boat yard that afternoon and evening and ran the genset repeatedly for several hours each time. The problem appears solved, for now. What I don’t understand is how the air got into the fuel lines initially. So I’m not fully convinced the problem won’t return sometime in the next few days or weeks. However, for now I have a working genset and the Bahamas cruise will continue after being on hold for a month. After over a month of flawlessly working, the generator failed once more. One evening in mid-March, I started the generator and immediately noticed that the output voltage was about 6 VAC. I shut down the generator, turned off all circuits and started it once more. My electrical panel still read only 6 VAC. I shut it down again and ran the engine that night to charge the batteries and run the frig. The next morning I tried the generator again and still got only 6 VAC on the meter. I opened the junction box on the generator (picture on the right), which contains all of the electrical wire connections. I checked the output of the generator with a multi-meter - again only 6 VAC. Automatic Voltage Regulator (AVR) After studying the operator's manual and the parts diagram, I decided to just order the Automatic Voltage Regulator (AVR) from my new best friends in Nassau. The existing AVR is shown in the picture on the left. I reasoned that this problem was likely electrical and not mechanical. A broken wire was a possibility, but I reasoned that broken wire the output would be 0 VAC not 6 VAC. Also I could find no wire breaks, at least not in the wires that I had access to. 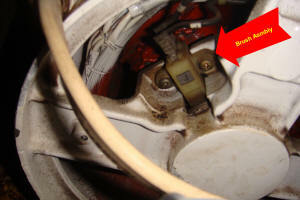 The other electrical components that might cause this problem are the brushes, the rotor and the stator. I couldn't deal with a rotor or stator problem and I knew getting access to the brushes would be very difficult, so by means of eliminating the problem sources I didn't want to deal with, I ordered a new AVR. The new AVR arrived in about a week (picture on the left) and it was easy to install. I quickly started the generator and once more saw 6 VAC on the electrical panel. Nuts! Now I was going to have to deal with those parts of the generator that I didn't want anything to do with. When all else fails RTFM (Read the F_____ Manual). Buried in the operators manual were specs on the ohm meter readings I should get from the three wires connected to the AVR. Two of the wires checked in specs, the wires going to the brushes showed infinite resistance (open circuit), which should have been around 17 ohms. The problem must be either in the brushes, the rotor or stator. Again using my preferred methodology of avoiding the least desirable sources of the problem, I placed an order for a new set of brushes. Generator Brush Assembly The picture on the left shows the existing brush assembly after I removed the cover plate on the generator. I removed the machine screws that held the cover plate in place without ever seeing them - the usual Braile boat maintenance process. I took this picture by blindly aiming my camera at this part of the generator that I can't see from the aft lazarette. To get at the brushes I'll have to get into the starboard cockpit locker - a very difficult fit for me. This is another blind picture of one of the rotor coils and a portion of the stator. You can probably guess why I really don't want either of these to be the problem. When I received the new brushes I started to look seriously at how I would install them. This is the view from the starboard locker. What I quickly learned was that the recently installed waterlift muffler blocked access to the brushes from this location. So to do the install from this locker the first thing I had to do was remove the muffler and exhaust hose. Since I really can't fit in this locker and do any work, I decided to bag the generator problem for now. This problem will have to wait until I get to a boatyard with the necessary Munchkin who can work in this restricted space. Then I'll likely find the problem is not the brushes. I can only guess what a new rotor or stator costs, or how they could be installed without removing the entire generator. In the mean time the Bahamas cruise continues without a generator. Upon returning to the USA in early May I took a berth at the Cape Marina in Port Canaveral, FL. I needed to rest after the 24 hour run from Great Sale Cay, but also I wanted to have a technician look at the generator and tell me what needs to be fixed. Cape Marina is the NL dealer for the area, so I figured their technicians should be able to work on the problem. Therefore I reserved a berth for a week, knowing nothing happens tomorrow in a boatyard. I filled out a work order for the generator and the next day met the yard manager. He immediately recommended I turn the job over to MarinePro in Cocoa, FL Turns out MarinePro is the leading Yanmar and Northern Lights service company for the Space Coast of Florida if not the entire SE. I felt confident turning the job over to them, but the only problem was fitting into their schedule. When you're the best you generally have a lot of work. After 3 days and a weekend I still wasn't on their schedule. I really didn't want to leave Port Canaveral without coming to some resolution on the generator. I felt once I left it would be a long time before I had access to qualified service personnel. So I persisted in calling MarinePro each day to check on the status of my work order. Finally the day before I planned to depart Port Canaveral I got a call from MarinePro that one of their guys would be here that afternoon, and around 2:00 PM he showed up and went to work. My biggest concern was that the problem was in the Rotor, which I knew might be prohibitively expensive to replace. My hope was that the Brush Assembly I purchased in the Bahamas would fix the problem. Very quickly the mechanic determined the problem was indeed the brushes. When he removed the brush assembly one of the carbon brushes all but disintegrated in his hand (photo on right). Since I had the spare Brush Assembly on board, he took only a few minutes to install the new brushes. I started the generator and once again saw 125 VAC on the electric panel.